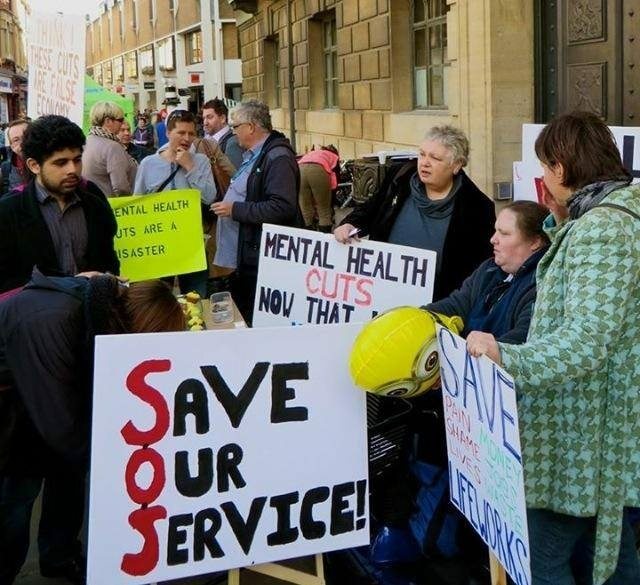 Requesting solidarity and support for people with complex mental health needs who are fighting to save Cambridgeshire’s last Complex Cases Service in the community, Lifeworks at 128 Tenison Road, Cambridge. A small, brave group of the disabled people have occupied Lifeworks round-the-clock since 4 March after being told the centre was being closed, and they would be discharged back to their GPs as of 25 March. There has been no consultation with them or their GPs, no Equality Impact Assessment, despite these being cuts that may well cost lives. The occupiers and supporters held a peaceful protest in Cambridge market square on Saturday. This morning various ‘men in suits’ with clipboards tried to enter the building on ‘official’ biz. Serco security turn up fairly regularly too. It’s intimidating. Unfortunately Complex Cases Service staff haven’t been allowed to continue working there during this period, so there are no mental health support workers on site. The first meeting the occupiers have been offered with a representative of either CPFT or CCG is tomorrow …. They would warmly welcome visits in person too. If it’s your first visit, it might be a good idea to let them know you’re a ‘friendly’ in advance – you can message them directly via the Facebook page. They make a mean cuppa!